Teenagers throughout the UK received their GCSE results today. We say rather them than us - we remember that sick, nervous feeling all too well, and we'd hate to have to open that envelope all over again. We especially dreaded the maths result. If there's one thing that we learnt from GCSE maths, it's that sums can sometimes be hard even when you're allowed to use a calculator. In many ways, the calculator paper was even harder than the other one - how does THAT make sense? Ah well, if calculators can't help us with maths, we can at least have some fun with them. No, we're not talking about typing 5318008 and turning it upside down - we're talking about the DIY Calculator. Not only is it better than us at maths, it also allows you to personalise it! 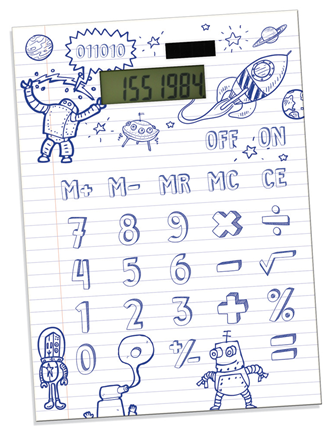 You can draw whatever you like on the calculator - if you want to make life difficult for yourself, you could even put the numbers on the wrong buttons. At least you'd be the only person able to use it! Oh, and since the DIY Calculator is our Deal of the Week, it's currently available for just £2.80. What are you waiting for? Get number-crunching! Groovy Gifts & Gadgets for 99p! In the age of the internet, it's all too easy to find a cool new gadget or an original gift idea. But gosh darn it, don't you always find that the best stuff is also the most expensive stuff? There are few things worse than stumbling across the perfect gift for your friend/family member/co-worker, only to check the price tag and realise that it's way, way out of your price range. Offers only apply while stocks last. Each offer cannot be used in conjunction with any other offer.